Israel is a hot country (except for ten days in the winter!) and children from kinder garden age are taught: If you go out, bring a hat and a water bottle. All the parks and public spaces have a water cooler. You will even find a water cooler, with disposable cups, in banks, medical centers and libraries for the use of the patrons. And on hiking trails you will often a tap such as the one in the photo. These taps have the sweetest, coolest water and hikers will drink their fill and then fill up their water bottles before they continue with their hike. Opening the tap just a little bit does not help. The tap is either closed or open 100%. And good luck trying to fill your water bottle, you have the catch the water on it's downwards arch - but only after you figured out the general direction of the spray, the upwards and downwards trajectory arch AND water velocity. In some cases a physics degree may be needed! 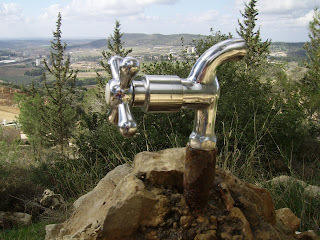 If you ever come across one of these taps, feel free to drink the water (it is safe) but be warned: These taps BLAST!